Why do we like magic when we know it's a trick? Why do we enjoy looking at magic? Everyone knows these are tricks and not "real". It's not as though we don't know our senses are being deceived. But we still watch and wait for the reveal. It might be more of a surprise to find there is a university laboratory dedicated to understanding magic - the Magic Lab, part of the psychology department at Goldsmiths, University of London. It's part of a growing interest in putting magic under much more rigorous, scientific scrutiny. Gustav Kuhn, reader in psychology at the university, is head of the Magic Lab - which stands for Mind Attention and General Illusory Cognition. As the title suggests, the principles behind magic are rooted in areas that overlap with psychology - perception, attention and how we process information. Magic is about manipulating our perceptions, "exploiting cognitive loopholes," says Dr Kuhn - and understanding how magic works is being recognised as having wider implications. "Misdirection" is a key part of magic - getting people to not look at what's important, but to distract them, change the subject, use a dramatic prop and push their attention elsewhere, so they do not see what is happening in front of their eyes. It's being used to to examine areas such as road safety, says Dr Kuhn, looking at how to make sure drivers can really focus on what's important. "How do people fail to see something even though they are looking at it?" he says. It's also applicable to bigger social and political questions, he says, such as how to respond to "fake news" and false information on social media. The lesson of magic, says Dr Kuhn, is that even if something is recognised as false, it still makes an impression and steals our attention, and researchers are looking at how understanding magic can help to investigate the world of conspiracy theories and fake information. Another key part of a magic trick is the "forcing technique". This is where someone thinks they are choosing a card at random, but the magician is really manipulating their decision and the "choices" are false. "Free will is an illusion. People are much more suggestible than they think. All of our perceptions are very malleable," says Dr Kuhn. This suggestibility and use of false options can be misused in a political sense, he says. But it's also important in understanding how eye-witness evidence can be so "highly subjective", with implications for the legal system. The attitude towards examining the connections between magic and science has gone from scepticism to becoming one of the hottest research topics, says Dr Kuhn. This week the Wellcome Collection in London is launching an exhibition into the Psychology of Magic, looking at what conjuring can tell us about the human mind and the "nature of perception". The University of London is also running an exhibition "Staging Magic - The Story Behind The Illusion". Dr Kuhn says he was interested in magic before he became interested in studying psychology. "I loved watching magic, the clever puzzles and techniques, trying to understand how it worked," he says. When he learned how to perform magic, he says he enjoyed the sociability, with the tricks becoming ice-breakers for the awkward years of growing up. Great magicians can perform tricks in a way that moves people like great art, he says. He mentions watching a card trick from the Spanish magician, Juan Tamariz. "I still don't know he did it, it was so beautiful. It almost connects you to childhood, when the world seems very magical." Watching him show a card trick was like seeing "Jimi Hendrix performing a guitar solo". He says that performing magic seems to have a particular appeal to people who are otherwise shy or introverted. In the psychology department, all the students can take an option in magic, and Dr Kuhn says learning to perform tricks has proved a big help with confidence. "It really boosts self-esteem," he says. 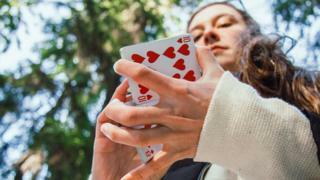 Hannah Laurence, a first-year student on the course, said that learning a range of tricks helped her to meet other students and to "step outside of my comfort zone". But what's the appeal of magic? Dr Kuhn says part of the fascination is trying to reconcile something that we've seen, with what we know is not really possible. Rabbits don't suddenly appear in top hats from nowhere. People can't get sawn in half and walk away. He says it's a sensation that produces a deep-rooted response, trying to reconcile this "cognitive conflict" and triggering part of the brain, the dorsolateral prefrontal cortex. From a very early age we are drawn to what we don't understand, says Dr Kuhn, with an evolutionary incentive to try to make sense of what seems to be unexplained. "We learn to develop this way," he says. Dr Kuhn likens the appeal of a magic trick to that of a horror film. If such bloodshed was seen in real life, he says, it would be traumatic and awful, but when it's shown in the safety of a movie, the fear becomes something that people can enjoy. Likewise, if we were confronted with something which disorientated and distorted our senses, it would be deeply disturbing, but when it's put into the context of a magic trick, it becomes entertaining and amusing. The fact that we know it's not real is an essential part of making it an enjoyable sensation. "It's an exciting time to be researching magic," says Dr Kuhn, showing how trickery can give "fresh insight into the strengths and weaknesses of our own minds".